Lawrence Bauerband's (1890-1962) grandparents immigrated from Germany in the mid-nineteenth century. He was born in Elizabeth, New Jersey in 1890. During his teenage years, Bauerband apprenticed in New York City at a hotel plant as an oiler, and worked as an electrician's helper at an apartment complex. 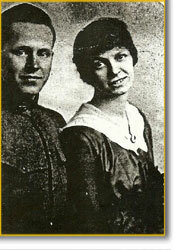 He married Blanche Arthurs in 1913, and in May of 1916, graduated from night school with proficiency in steam engineering and shop mechanics. The same month Bauerband was hired by Mrs. Cornelius Vanderbilt II as Superintendent for The Breakers. 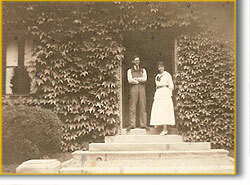 The young couple moved to the caretakers lodge, located on The Breakers property in Newport. Bauerband enlisted in the U.S. Army in September of 1917 and was placed in charge of directing men in the use of various signaling devices. After the war he was hired as chief electrician for a construction company in NYC. He moved on to be chief engineer for Bonwitt-Teller department store's power plant, then became maintenance superintendent for Salmon properties in New York. In the 1950s Bauerband invented and patented an x-ray drying machine. Always impeccably dressed and with flawless deportment, he was known to his friends as "The Count," and was dubbed "Chief" by co-workers after a 20 year stint as chief engineer for Stern Brothers Department Stores in New York. Bauerband family oral history recounts that a principal of a consulting engineering firm in New York recommended Lawrence Bauerband to Mrs. Cornelius Vanderbilt for the position of Superintendent. Mrs. Vanderbilt inquired if the young man "was heavy enough" (not in reference to physical weight but his experience) to handle the maintenance responsibilities of The Breakers elaborate electrical, mechanical, heating, and plumbing systems, which included: a highly sophisticated 6' x 6 1/2' switchboard that could convert electricity from street service to an in-house generating plant; an indirect hot water heating system with 25,000 superficial feet of heating surface with a remote boiler plant and connecting pipes running through a 360 foot tunnel; three sources of water supply - filtered rain water, salt water, and city water - held in eight tanks with a combined capacity of 71,500 gallons. 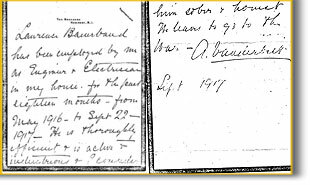 During his brief but noteworthy tenure at The Breakers, Lawrence Bauerband kept a meticulous log book where he diligently recorded all maintenance activities, problems he encountered, and creative and efficient solutions. He also managed an assistant and a night watchman for the property. Mrs. Vanderbilt was well-pleased with Bauerband, even granting praise for achieving the lowest heating costs ever at The Breakers. Bauerband's two sons, Bill and Roy have donated their father's log book and other significant family memorabilia and photographs to The Preservation Society of Newport County. 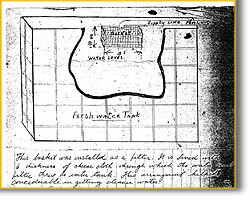 At left is an entry from Lawrence Bauerband's log book illustrating how he devised a filter for the fresh water tank for cleaner water. Mrs. Vanderbilt provided Bauerband with a letter of recommendation for future employment after the service. She commended him as being "thoroughly efficient & is active and industrious & I consider him sober & honest."